Should I have my credit card limits lowered so I can avoid having high debt? The person asking the question has a history of carrying a high credit card balance, but has recently paid down a considerable amount of that debt. Despite making inroads on their credit card balances, they are worried about backpedaling. It is great that they have recognized their struggles with credit card debt and paid a chunk of that debt off, but reducing limits may not be such a good idea. FICO builds thirty percent of your credit score based on the amounts that you owe on current credit accounts. That calculation takes into account your credit utilization ratio. Your credit score gets a boost if the balance on revolving credit accounts (credit cards) is under 30 percent of the available limit. On the other hand, your score suffers if the ratio is greater than thirty percent. If you have a credit limit of $10,000 and a balance of $2,000, you are sitting pretty at twenty percent. Lower your credit limit to $5,000 as a way to prevent yourself from overspending and your ratio jumps to forty percent. That jump in your credit utilization ratio could drop your credit score a fast fifty points. It could take several months for you to pay the $500 plus interest necessary to get your ratio back down to a desirable level. Don’t Close Those Credit Card Accounts Either! Another option often considered when people want to keep their debt down is to close credit card accounts. That can be more damaging to your credit score than lowering your credit limits. While the length of your credit history only accounts for fifteen percent of your FICO score, it is the hardest to recoup. You can pay down a high utilization ratio, pay off old debts, etc, but the only way to boost the length of your credit history is to wait for years to pass. From personal experience, I have found that a great way to keep your spending down is to force yourself to reconsider credit card use each time you feel like reaching for one–a common habit of the debt-free. I did that by putting my credit cards in a locked toolbox that is in the shed at the rear of my property. In the beginning, I started out to the shed to get one of them on a regular basis. The time it takes to walk out there was spent rethinking the need and wisdom of using a credit card. Quite often, I talked myself out of buying whatever I had on my mind with a card and saving for it instead. Which leads me to the second option. The second option is to tweak your budget so that you can save for items that you are tempted to purchase with a credit card. While you are saving for something, you may find that what thought was a need is only a want and reconsider the purchase altogether. After you find the right place to hide your cards from yourself, you may want to look through the terms for each credit card. Some card issuers will automatically close an account if these is no activity on it for a certain period of time. If that is the case, simply charge something small. Something that you can pay for the same month that you charge it. Hiding my credit cards from myself helped me to repay a large credit card debt and learn a new way to use those cards. Hopefully, you will be able to do the same or find another way to control your spending without damaging your credit score as mentioned above. 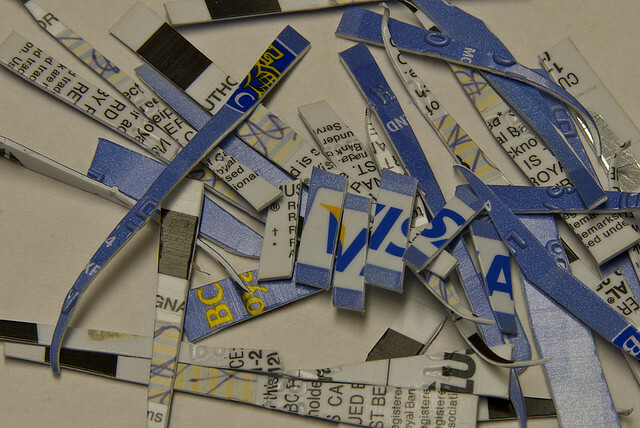 What are some ways you’ve been able to control your credit card spending in the past? Did you ever do anything like freeze or lock up your credit cards? How soon after paying off debt did you get a new card? I’ve heard several different ideas for what to do with your cards when people aren’t using them, but this is probably my favorite. I love that you had to think it the whole way back there while you were walking. It makes sense that you wouldn’t want to use them by the time you got back there. I know! Wasn’t that the best idea to counteract the temptation? You can’t just pull out the credit card and swipe it. You’ve got to spend all that time trudging out to the shed, deliberating as you go, often talking yourself out of it. I love this idea! The trip was particularly miserable in the winter. That kept the Christmas spending down for sure! When a person closes a credit card account the history remains on the credit report for another seven years. You do not have to wait five years for your score to recover as suggested. Many credit score tips get repeated often enough they accepted as true, whether they really are or not. If someone has difficulty controlling spending, canceling a card account may be the best option. Yes, closing the account hurts your utilization ratio. That ratio changes every month. A late payment stains your report for seven years, and is best avoided. I guess it depends on the age of the account, right? If it was far and away your oldest account, years later when it does fall off your credit report, it will shorten the overall length of your credit history, thereby hurting your credit score. If it’s not your oldest account, then it really wouldn’t matter. We carried a balance years ago but haven’t in a really long time. Now we pay our credit cards off several times per month. It helps to have a plan and stick to it. No doubt. This is how I handle it now. I do use my credit card, but I pay it down to zero each month. Great way to handle your credit cards Holly. As much as possible, I leave my credit card on my house and only bring it when I have planned purchases. This lessens my chances of making big, impulsive purchases. Another solid credit card policy, for sure. I have recently posted about how my credit cards limits have been substantially increased. As I owed almost £18k ($28k) on credit cards this time last year (now just over £9k/$15k) having large limits is scary to me, but I am also aware that the higher limits make me look a little better in the eyes of the credit reference agencies so for the time being I am not reducing my limits. I keep my credit cards in a different wallet than the one I use on a daily basis. At least that way I do not suddenly buy something I can’t afford on my lunch break. I know someone who keeps hers frozen in a tuppaware in her freezer. Ultimately though I am sick and tired of being in so much debt so can trust myself not to use credit cards anymore. Victoria, I am glad to see your debt going down. Great job! It is also good to hear that you are gaining confidence in your ability to control your spending. I haven’t carried a balance on my credit cards in a long time, but I remember the times that I did. Paying that interest is a killer. I just had to stop using my credit cards for a while, but I just left them inside on my nightstand drawer. I was fortunate to have a little self control and not reach for it until I was done paying my debt, but I like your idea of locking it up outside. I’m too lazy to go through all those steps just to buy something. Me too, Aldo! What a way to put your laziness to good use, ha! Credit utilization makes up a pretty big part of the FICO score – great tip! Thanks, Katie! Everyone always forgets credit utilization, seems like!